Shopping for a new Acura ILX? The $1,750 Premium Package mostly transforms the Acura ILX from an economy car to a budget luxury car. The 2019 Acura ILX delivers some luxury car goods, but we’d spend our money on a loaded-up Honda Civic instead. The 2019 Acura ILX is like a fresh college grad ready to climb the corporate ladder. It’s outfitted in the right duds, but its rough-edged past can show through. The ILX costs about $27,000 to start but a trio of option packages can bump that to about $32,500. That’s inexpensive for a car with a semi-designer badge, and it reinforces the ILX’s status between mainstream and luxury makes. 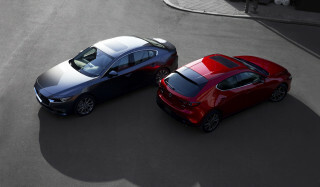 The ILX’s new look this year doesn’t stray far from the outgoing model, which debuted for 2013. LED headlights up front and a sharpened beak bring the ILX in line with its sedan and crossover siblings. Underhood, the ILX uses a 201-horsepower inline-4 paired to an 8-speed dual-clutch automatic transmission and front-wheel drive. That sounds like a sporty combination, and it dabbles in fun when pushed. The ILX has a pleasantly athletic feel, though its suspension is tuned more for commuting than it is for canyon carving. 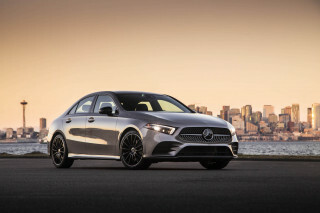 This year’s new A-Spec option package adds upsized wheels but is a styling statement rather than a performance upgrade. At 28 mpg combined, the ILX is relatively fuel-efficient compared to luxury cars even though Acura recommends costly premium fuel. Inside, the ILX has comfortable front seats but head room can be a problem for taller riders because of the standard moonroof. This year, Acura subbed in a new dual-screen infotainment system that finally makes Apple CarPlay and Android Auto compatibility optional. Newly standard automatic emergency braking, adaptive cruise control, and active lane control complement good, but not perfect, crash-test scores from federal and independent testers. 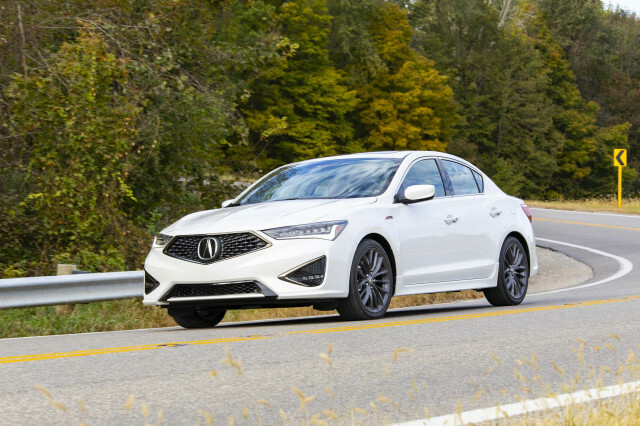 This year’s nip and tuck doesn’t mask the fact that the 2019 Acura ILX’s shape dates back the better part of a decade. From some angles, the 2019 Acura ILX looks like it fits in well with the other sedans and crossovers scattered across Acura’s showrooms. Look closely, however, and it has more in common with the used-car lot. 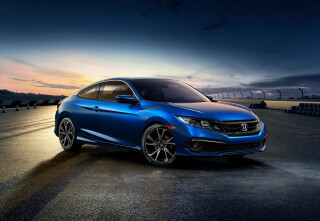 That’s because the ILX’s shape dates back to the 2013 model year and its underpinnings come from the 2012 Honda Civic. This year, Acura grafted a large, angular grille flanked by standard LED headlights onto the ILX’s front end. The look is echoed at the rear with new taillights and a revised rear bumper compared to last year’s car. Inside, the ILX has a busy, low dashboard. Base models have myriad buttons for their basic audio system with a remote screen housed under a large hood. Models with the optional Premium package sub in a 7.0-inch touchscreen for most of the audio buttons that looks more modern but does little to alleviate the narrow center console and haphazard climate control vents. This year’s new A-Spec appearance package adds an exterior body kit and a few sporty-looking bits inside, but it hardly transforms the ILX. The 2019 Acura ILX is a willing performer, but it lacks polish. The 2019 Acura ILX has a spec sheet that should impress, but even in A-Spec form it’s hardly a thrilling ride. Just one engine is on offer, and it’s a sweet one. The 201-hp 2.4-liter inline-4 happily revs all the way to its 6,800-rpm redline. With 180 pound-feet of torque, the ILX won’t win a drag race, but the engine provides spirited acceleration in most situations. The high-tech 8-speed dual-clutch automatic is a delight, whether left alone or hustled through the gears manually via steering wheel-mounted paddles. Peel away the Acura badge and the ILX traces its roots to the last-generation Civic made by parent company Honda. Frankly, we’re surprised it’s lasted as long as it has in Acura’s lineup since Honda substantially reworked the Civic back in 2016. The ILX lacks the latest Civic’s deft handling and balanced ride. Instead, the Acura’s light steering filters out the road and leaves the car feeling anodyne at best. The soft ride works well as a commuter but allows too much lean into corners to succeed as a budget sports sedan. ILXs with the 18-inch alloy wheels included in the A-Spec package that we’ve driven have traded that softness for an unpleasant combination of too much suspension travel paired with too little sidewall. The ILX has more sound deadening than the old Civic, so it’s reasonably quiet at highway speeds. A too-low roofline means the 2019 Acura ILX isn’t suitable for taller drivers. Up front, the ILX features standard synthetic leather upholstery and an eight-way power-adjustable driver’s seat. Leather and limited power adjustment for the passenger’s seat are part of the $1,750 Premium package we imagine most ILXs on lots will feature. With 38 inches of head room, the ILX can accommodate average adults but may have taller drivers brushing the roof. The rear seat has decent leg room for a smaller car but the roofline cuts deeply into head room, leaving just 35.9 inches. Cargo isn’t any better off. The ILX’s 12.4 cubic-foot trunk can’t handle much more than a large suitcase. The ILX’s interior is well-finished with solid, price-appropriate materials, but it’s hardly luxurious. The 2019 Acura ILX comes with good standard safety gear. The ILX’s five-star overall rating from the NHTSA has a couple of blemishes, though. The smallest Acura earned four-star frontal crash and rollover ratings. The IIHS rated the ILX “Good” in all of its instrumented tests, but its LED headlights rated “Poor.” That’s a surprise given the headlights are a new design this year and it’s enough to keep the ILX from earning a Top Safety Pick award. At least the standard automatic emergency braking system earned a “Superior” score. The base 2019 Acura ILX lacks a few features rectified by a reasonably priced option package. The 2019 Acura ILX is inexpensive for a luxury car, but it’s not especially lavish. The base ILX costs about $27,000, which means it’s priced like a high-end Honda Civic EX-L. The ILX gets the basics down—power features, USB port, Bluetooth connectivity, power moonroof, power driver’s seat, heated front seats, and synthetic leather upholstery. But adding Apple CarPlay and Android Auto compatibility, an 8.0-inch touchscreen for infotainment, leather upholstery, means spending $1,750 for the Premium package. That’s where we’d stop, and it puts the ILX on par with the more engaging Civic. 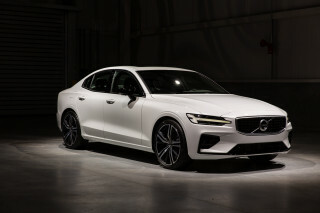 If you must, the $1,900 Technology package includes navigation and an ELS audio system and this year’s new, $2,000 A-Spec package adds flash but not substance. The 2019 Acura ILX is reasonably efficient but runs on expensive premium fuel. A premium fuel recommendation means that the 2019 Acura ILX isn’t as cheap to run as its 24 mpg city, 34 highway, 28 combined EPA rating suggests. The 2019 ILX rates a little lower than the Audi A3’s 29 mpg combined rating but is on par with the Mercedes-Benz A-Class’ 28 mpg combined figure. Mainstream brands don’t typically recommend premium fuel and generally earn better EPA ratings. The Honda Civic is rated at between 33 and 36 mpg combined, for instance. Looking for a different year of the Acura ILX? 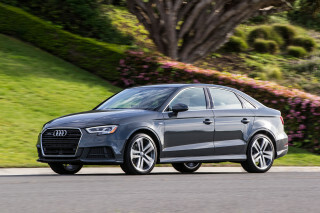 Lease: From $239 for 36 mo.